So according to The Rock’s Twitter account he is either going to be Shazam or Black Adam. We will have to wait to find out. 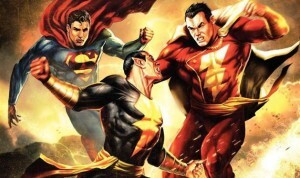 If he is indeed going to be Shazam, it lends credence to that list of DC movies leaked earlier. I can’t wait to find out! Previous PostPrevious Comic Con Starts Today! Next PostNext SDCC 2014 Wrap Up!